Podcast listeners of Los Angeles! 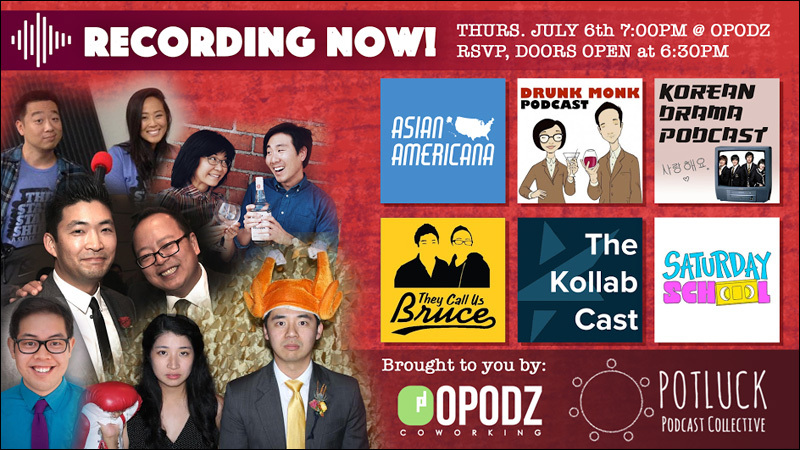 You're invited to a special event featuring the creators and hosts of shows from the Potluck Podcast Collective, including Kollabcast, Saturday School, Drunk Monk, Asian Americana, They Call Us Bruce and the Korean Drama Podcast. The evening will include a panel discussion with the Potluck hosts and a live recording of They Call Us Bruce with a special guest. Stay after the panel for a live recording of They Call Us Bruce, with special guest TO BE ANNOUNCED! 8:00pm Live recording of "They Call Us Bruce" ft. Special Guest. The event is free. Be sure to RSVP here. Hope to see you there. For further information about the Potluck Podcast Collective, go here.